3D Solid Modeling is a method to build, store, and display representations of three-dimensional objects. Also called feature-based modeling or parametric modeling, this design method requires the precise definition of all parameters of a part. Having all parameter specifications in a single part file, i.e. dimensional information, material specifications, part and vendor information, etc. this allows for easy manipulation of the part or assembly file to do such things as interference detection in an assembly, material analysis to detect design weak points, animation of moving components, and automatic bill of material insertion. 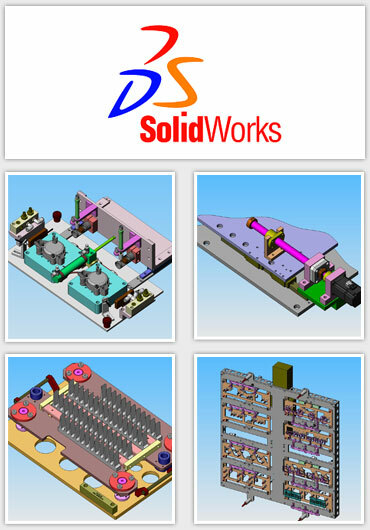 Solidworks is our primary design CAD software and Amtek Precision Products is a member of the Solidworks Manufacturing Network. Utilizing the power of Solidwork's modeling and surfacing capabilites, Amtek has been able to manufacture contoured nesting to fit perfectly with complex injection molded plastic parts. Using Solidworks along with the capabilities of Amtek's CMM, we have been able to reverse engineer complex, tight tolerance, interchangable tooling for foreign made equipment for which there is no CAD or dimensional data. 3D Solid Modeling provides clarity with geometries that are hard to visualize in 2D, and enables the seamless communication of design ideas and concepts with co-workers, suppliers, and customers.